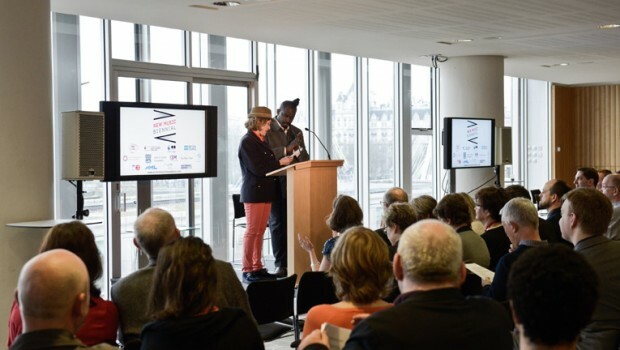 PRS for Music Foundation has today (26 April, 2013) announced twenty composers and commissioning organisations who will participate in the first ever UK-wide New Music Biennial. Beginning in January 2014, the first edition of the New Music Biennial has been developed in partnership with Creative Scotland, Arts Council England and the British Council. The 20 brand new commissions selected from over 130 proposals will receive premiere performances in 2014 across the length and breadth of the UK. All twenty pieces will also be featured at two weekend showcases hosted by London’s Southbank Centre (4-6 July 2014) and Glasgow UNESCO City of Music (2-3 Aug 2014) and on BBC Radio 3. NMC Recordings will be releasing each piece of new music via digital downloads. The works selected for the New Music Biennial cover a wide range of genres, reflecting the diversity and richness of musical life across the UK – from contemporary classical, folk and jazz to world music, urban and electronic. Commissions include composer Matthew Herbert whose new piece will use the sounds of 20 pianos from across the world, Shingai Shoniwa, lead singer of the Noisettes collaborating with David Okumu, two projects for brass band (a collaboration between Andy Scott and poet/playwright Lemn Sissay and a commission for composer David Sawer with Onyx Brass) and a folk commission led by composer and broadcaster Mary Ann Kennedy which will consist of songs created on ferry crossings in the Scottish Highlands, to be performed in Inverness and on the Ardnamurchan peninsula. Other commissions include accomplished jazz musician Gwilym Simcock working with City of London Sinfonia and clarinettist Michael Collins and a project led by Tête à Tête Opera in which young composer, Samuel Bordoli will bring together opera and skateboarding in London and Scotland. The New Music Biennial commissions were chosen by an expert judging panel including one of the UK’s most eminent musicians Dame Evelyn Glennie, singer/songwriter and broadcaster Cerys Matthews, award-winning composer Max Richter and multi-talented composer/saxophonist Jason Yarde, the Southbank Centre’s Head of Classical Music, Gillian Moore and Director of Glasgow UNESCO City of Music, Svend Brown. The panel was chaired by Roger Wright (Controller BBC Radio 3 & Director BBC Proms). “As lead funder of new music in the UK, we’re constantly inspired by the imagination and quality of the many composers and commissioning organisations we support. The New Music Biennial gives us the opportunity to celebrate this creativity by presenting outstanding new music – in any genre – which has the potential to inspire audiences across the UK. Cerys Matthews, comments: “Can’t wait to hear the new ferryboat songs from the Scottish highlands and a choir singing on a skateboard ramp”. The New Music Biennial opened earlier this year, when organisations from all over the country submitted ideas for commissions they would like to realise with a UK based composer, working in any genre. They were invited to present commissioning ideas that would result in outstanding new music and include an international dimension that could tie in with Glasgow’s hosting of the Commonwealth Games – whether a conceptual realisation or collaboration with partners overseas. The full list of 20 commissions is below. Composer Niraj Chag will create a new multi art-form piece that will explore his cultural heritage by taking front pages of newspapers from East Africa, India and the UK, pinpointing a date in history. This commission will incorporate live music, image and dance. Experimental folk trio Lau will write 15 minutes of new music for themselves and Elysian Quartet. The group have forged new tracks for their native Scottish music and they will extend this exploration further with the Elysian, perhaps the most respected contemporary string quartet in England today. This commission fuses the worlds of classical music and jazz, and celebrates the virtuosity of City of London Sinfonia Principal Conductor and Clarinettist Michael Collins with a distinctive new work for Clarinet, Strings, Jazz Trio and Speaker. The project brings together some of the UK’s most exceptional musical talents. Artist and musician Yann Seznec will create a new installation and performance for Edinburgh Art Festival’s common-wealth, a major international exhibition of contemporary art selected from five continents to coincide with the 2014 Commonwealth Games. The work will explore the relevance of ‘commons’: those things we value and hold in common. ‘A Child Like You’ looks at the world through the eyes of a child in care. Poet Lemn Sissay is one of these children. Award-winning composer Andy Scott will write for Foden’s Brass Band, singer Anna-Clare Monk and harpist Lauren Scott. He will collaborate with Sissay, who will narrate this powerful, thought-provoking and uplifting work. This commission will feature an outstanding international quartet representing four countries from the Commonwealth; Scotland, England, Canada and Australia. The project explores the many drove roads or tracks set deeply into the Scottish countryside and the long-vanished trade of Scottish cattle-droving through its hardy highland cattle drovers and their wider connections to the New World. Arlene Sierra’s ‘Urban Birds’ brings together three international soloists in a tour de force for three pianos with electronics, sampled birdsong, and percussion. The new work will combine spectacle with refined classical keyboard artistry, juxtaposing harmony, rhythmic drive, and sounds from nature. Filmmaker Bunny Bread weaves a tale of guilt and innocence from three distinct perspectives. The accompanying live score guides each unique telling of the story as composer Akwasi Mensah explores how dynamics in music can be used to manipulate the emotions of an audience. This theatrical new work by Luke Styles will feature experimental vocal trio Juice and Trish Clowes’ jazz/classical ensemble Tangent, performing alongside three live dancers. Blurring the boundaries between dancer and musician, this evocative piece will retell a Native Canadian folk tale in a playful, highly dynamic way. A gift arrives. What’s inside? Curious? Then follow talented learning-disabled composer Jez Colborne on a musical odyssey to discover what it means to be gifted. Avant-garde composer Piers Hellawell and improvising virtuoso Bourne Davis Kane collide in a shared space; the goal is music created by all of them. Both parties leave behind established writing methods to learn from one another, undermining assumptions about both improvising and the notation of music. Mr McFall’s Chamber is celebrating historic links by commissioning Bermuda-born composer Gabriel Jackson to set poems about island life by both Scottish and Caribbean poets to music. Celebrating the group’s 21st birthday, the acclaimed Onyx Brass presents an exciting commission for brass quintet by composer David Sawer in over twenty informal and free outdoor performances across Britain’s historic bandstands, outdoor festivals, and public spaces. The project will bring contemporary music out of the concert hall and on to the village green. The Noisettes’ Shingai Shoniwa and acclaimed singer-songwriter/producer David Okumu are coming together to create a new vocal work inspired by the values of the 2014 Commonwealth Games. It will be performed by different vocal forces, including community choirs. sound, Red Note Ensemble and Woodend Barn are commissioning Stephen Montague to write a new children’s work for 6 musicians and narrator. It will be based on tales sent in by children from different countries across the Commonwealth and rewritten by award-winning playwright Zinnie Harris. Blending skateboarding, choral singing and the unique acoustic of skate parks, Tête à Tête and composer Samuel Bordoli team up with skaters and community choirs to make a real noise in London, Aberdeen and Glasgow. The Royal Philharmonic Society brings Dobrinka Tabakova’s youthful classical music out of the concert hall and in to Ruth Paxton’s bold film-making. ‘My Pulse, My Place’ is a film about the energy and diversity of life in a modern city, unearthing the driving forces behind the mix of international societies and cultures. A unique musical collaboration between one of the UK’s most talented Steel Pan musicians, the world’s most respected English concertina player, a DJ, clog dancer and youth steel bands from the UK and the West Indies. The project will create high impact performances which will excite audiences in both the UK and Trinidad. Matthew Herbert will be telling the stories of twenty unique pianos from around the world; from Steinways at famous locations, to forgotten out-of-tune family pianos. The composer will sample each piano, document it in photographs and record short oral histories. The composition, for solo pianist, will be played on a simple table, turned into a virtual piano through bespoke soft/hardware created by the Radiophonic Workshop. ‘Aiseag’ (The Ferryboat):.A lifelong fascination creates a journey between the Highlands and Canada’s Gaelic diaspora. Mary Ann Kennedy and Scott Macmillan will work with audio designer Nick Turner and poet Aonghas MacNeacail to create a new work combining electronica, found sound and musicians from both Cape Breton and Scotland. The New Music Biennial builds on the success of New Music 20×12, a music commissioning programme that saw more than 250,000 people experience new music from leading figures in the fields of contemporary classical, jazz and folk music. Composers including Mark-Anthony Turnage, Sally Beamish, Jason Yarde, Emily Howard, Julian Joseph, Sheema Mukherjee, Howard Skempton, Anna Meredith and Graham Fitkin were commissioned for this exciting programme and were brought together with a wide array of organisations and performers in a weekend celebration at London’s Southbank Centre, a highlight of the Cultural Olympiad. Rambert Dance Company, actress Juliet Stephenson, the OAE, Music in Prisons and performance poet Ian McMillan are just a few of the many artists who were involved in New Music 20×12. The New Music 20×12 works were made available to people through a variety of ways – over 120 concerts, downloads from NMC Recordings (www.nmcrec.co.uk), BBC Radio 3 broadcasts and films on The Space (www.thespace.org), the new digital arts service developed by Arts Council England in partnership with the BBC. Additional support has been given by John S. Cohen Foundation, Jillian Barker and David Cohen, who initiated New Music 20×12, Arts Council of Northern Ireland, Arts Council of Wales, the Incorporated Society of Musicians, The Bliss Trust and The Finzi Trust.